On last week’s Blog Talk Radio show, I talked about our friends in the animal kingdom acting as messengers from Spirit, and asked my listeners to pay attention to what they saw for the upcoming week. I noticed many sparrows around, so this post will focus on the message from Sparrow- using my favorite deck, “Bird Signs: Guidance & Wisdom from our Feathered Friends,” by G.G. Carbone, illustrated by Mary Ruzicka. 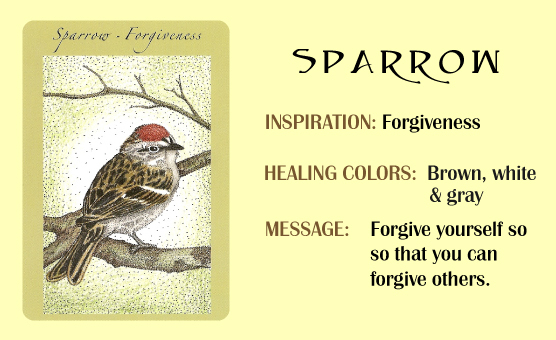 According to the deck, Sparrow is the medicine of forgiveness. Usually when we think of forgiveness, we think about others who we feel have hurt or offended us, but in my case, the message of self-forgiveness. Sparrow was pointing out that until I forgave myself for the things that I was beating myself up about, I would not move forward. The funny thing about Spirit, is that when you ask for an answer, it always arrives in a way that you will notice. If for some reason you are not ready to hear the answer, Spirit will not give up. It’s as easy as paying attention, and then doing a little homework to find out more about the clever messenger Spirit sent your way. In this case, Spirit heard my thoughts about where I am in my life and my feelings of being stuck in place and literally sent a messenger from the sky to show me the way. How amazing is that? What messengers are being sent to answer your questions? ~ by healingstarspirit on May 26, 2012.